After a week and two workshops in Dublin we are now on our way to Galway to deliver one more. 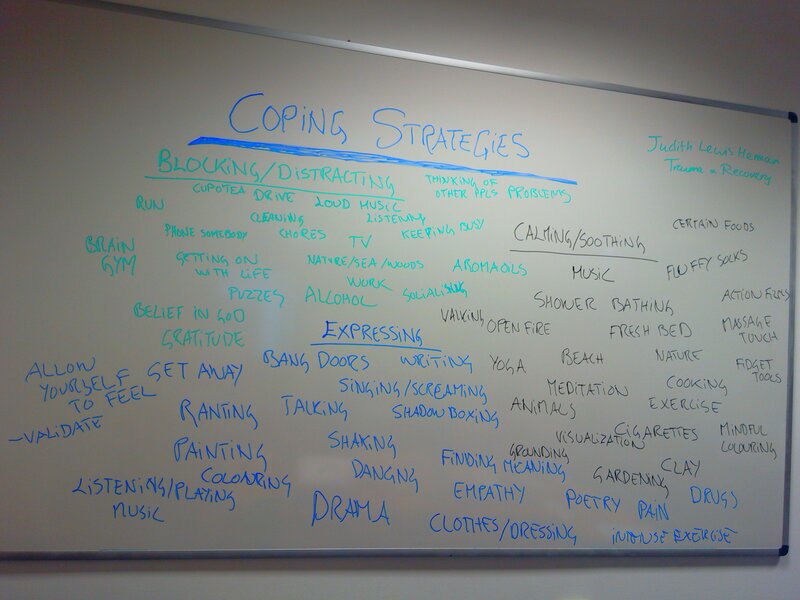 The workshops are called ‘Talking with Voices – Learning from the Dialogue’. With these workshops we try to create spaces for people to learn more about VoiceDiaologue and how to engage with people who hear voices. We enjoy having a mixture of participants (people who hear voices, people working in services, families and friends of people who hear voices and anyone who is interested in the subject) as we very much believe in a community based approach to changing the conversation around voice-hearing. One of the ways we try to increase understanding of voice-hearing, is by getting participants to explore the continuum we are all on. We don’t all hear voices but most people can relate to having different parts come out in different situations. For example, at work our responsible parts, at a sports event our passionate parts, our caring parts with children or loved ones and then when we are tired maybe our irritable or inpatient parts come out. Some people relate to having inner dialogues or experiencing having an inner critic telling us about mistakes we have made. Sometimes participants are surprised and maybe a little bit disconcerted that we ask them to look at themselves but we try and create a safe and respectful space for this exploration. We share from our own lives and use examples from our relationship with each other to try and normalise this continuum of experiences. Looking at ourselves as multi dimensional is challenging as many people tend to live compartmentalised lives. When at work one can be in a work-identity which might be different to one’s family-identity. So at first thinking about different aspects of oneself can be difficult. Our most dominant identities – or selves – might want to protect us from the vulnerability and complexity that can occur when we move away from seeing ourselves as uniform personalities. It feels like a great privilege to share these ways of looking at the psyche with people who come to our workshops. We are often moved by peoples willingness to try out the exercises and role-plays we suggest they can do. Every group is different and every training event is an opportunity for us to learn and think about how we deliver our workshops. Travelling and working in Ireland is an experience we treasure. This is the second year we are delivering these workshops over here and we looked forward to coming back. Some of the selves that seem strong in Irish culture and that we really value are the friendly welcoming self, the generous self, the relaxed self and the storyteller. For example a bus driver refused to take our fare in exchange for us listening to a couple of stories he wanted to tell us. Or another time where several passengers helped pay our fare back when we didn’t know we needed coins. Or the participant who mischievously sang us songs about Danish and English invaders and gave us poetry. There is a sense that there is always time to talk with each other, whether it’s when you ask for directions in the street or chat with a B&B host in the morning. There is curiosity and also willingness to share a philosophical thought, an opinion or a story. We have been thinking about how in this time of Donald Trump and Brexit it seems even more important to challenge ‘them and us’ thinking. To spend time talking and listening to each others experience; trust that it is possible to find common ground despite different perspectives. Up to very recently people who experience hearing voices have been seen as freaks or pitiful individuals who lives would only be improved if they stopped hearing voices. There’s has been a couple of TV-shows in Ireland about voice-hearing of late and hopefully this will help break down the traditional silence and stigma around these experiences. Self-help groups for people who hear voices or have similar experiences are part of this shift that is slowly happening. A popular exercise we do in the workshops is asking people to write to a part of themselves and then write back to themselves from that part. It may sound strange to interview a part of yourself with questions like ‘how are you?’ and ‘what do you want for me?’ but people are often surprised that this can lead to an interesting conversation. Sometimes a hardworking part of ourselves might tell us they are exhausted and that we might do well to take care of them – and the rest of ourselves – by slowing down and have some rest and recuperation time. So we believe its sometimes healthy to talk with ourselves and listen creatively to what different parts of ourselves feel and think. It seems to be one way to reflect and also be gentle with ourselves. One person told us that they could see this exercise help them with writers block. We do not believe that people’s distress or voices come out of the blue – everything happens within the context of people’s lives, their community and history. We don’t think it is possible to confine problems to exist only within the individual so we need to think about how we do things as a society/community. If we want to help people with the voices they hear, we might have to think about ourselves differently e.g. we cannot expect people who hear aggressive voices to find constructive ways of living with this experience if we are not willing to work on becoming more comfortable with our own aggression too. We are grateful for this opportunity to share our passions and we want to thank the Irish Institute for Mental Health Nursing for organising our workshops. They have some great events coming up in November and December (see more HERE). Were also grateful to all the participants who came – and some of them came a long way to join us (hence the title of this post)! 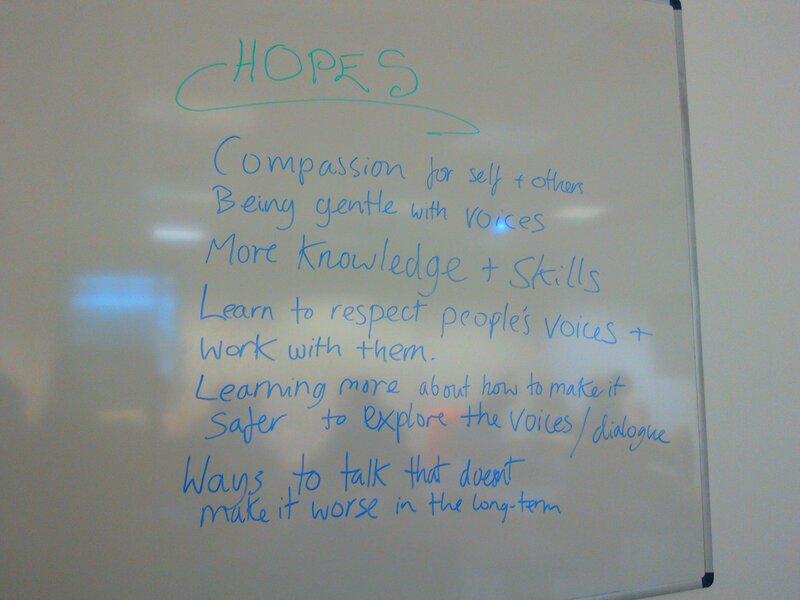 We found that our need for openness, respect, consideration, awareness, enthusiasm, humour and growth were met. Thank you.